The X38 Plymouth to Exeter service has seen a few types come and go over the years. These Willowbrook coaches were the norm for a few years in dedicated liveries. I always thought they were ugly, especially compared to the Plaxton coaches that were being delivered at the same time. I never really thought they were that comfortable either but they did last on the route for quite a few years. However bad they were they were a lot better than anything the Transit Holdings period brought. Plymouth to Exeter never suited minibuses at all. The Stagecoach era couldnt come quick enough and one of the first things they did was to put brand new coaches on the service. Amazingly these coaches have ruled this route for eleven years now. Tridents do appear at busy times but apart from that they are still standard fare for the X38. The plan to introduce ex Megabus Olympians sadly never came to anything due to route clearance issues through Ashburton. Will 2008 finally see these long serving coaches off? 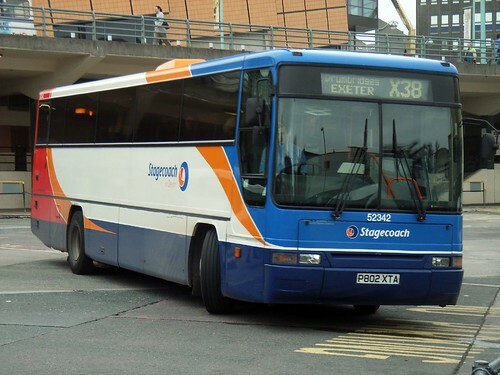 Stagecoach are placing new coaches into service elsewhere in the country on similar routes - especially in Scotland. However Stagecoach were cutting back services in the second half of last year including the X38 so new coaches for this service might not be on the menu just yet? And don't forget the bendi coaches that ran on the route for some time. I must admit I had forgotten about them - they were not here long but they were great coaches. Worst trip I ever had on the X38 - one of the ex London Alexander bodied automatic Mercedes 811s - I think it had a top speed of 40mph - and that was downhill with the wind behind it!